From 9 AM to 3 PM, the open house will be open to the community in order for people to learn about our programs, meet the staff and students, and have fun! The day will include student performances, arts and crafts gallery, fun activities and games. We will also be selling food and drinks. Please come and join us for this exciting event! Donate in kind to help support a sunshine child. Stories from our sunshine children. 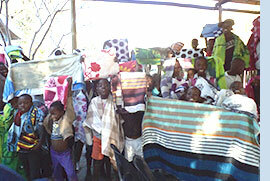 Northern Botswana is home to many orphans and vulnerable children. Learn more about the situation in Maun. Aliquam sagittis magna in felis egestas rutrum. Quisque posuere, purus sit amet malesuada blandit, sapien sapien auctor arcu, sed pulvinar felis mi sollicitudin tortor. Donec et lectus et sem rutrum sodales. Maecenas volutpat, nisl et dignissim pharetra, urna lectus ultrices est, vel pretium pede turpis id velit. Aliquam sagittis magna in felis egestas rutrum. For the past two weeks, I have worked with 18 other highschool and college students at Bana Ba Letsatsi. Every single student has had a unique experience here, so I can only offer my own. When we first arrived at Bana Ba Letsatsi, I had no idea what to expect. I knew that we would be working with children and completing various other projects, but that was the extent of my knowledge. We first got here on a Saturday for Solid Rock Training, in which Mma Beauty introduced us to the culture of Botswana and showed us traditional games and practices. We got to meet a few of the kids at the center that day. Seeing their smiling faces made me excited for the weeks ahead. Excitement surrounded Flatt and his team’s visit to BBL. Flatt, KDB’s head honcho, showed he was a good sport by judging a card competition for the children; the children had drawn and coloured cards in honour of KDB’s visit. BBL teamed up with SAREP and the Okavango Artists Association during the school holidays for a 4-day long “Arts and Life Skills” workshop. The program consisted of two days of life skills lessons covering topic such as HIV/AIDS and goal setting. As part of our Life Skills and income generating programs we have started a vegetable garden and poultry farm here on the BBL grounds. The students have been working hard for the past few months on making plots, planting seeds, and watering the vegetables daily. They have also been working on a business plan to get funding to buy chickens.